I have been a collector of classic cars for 35 years. This is one of the classics from my personal collection,see others at www.gccc.us. This 1953 Chevy had its frame-off restoration in 2006. It sports a 4.3L Chevy S10 Vortex engine, coupled to automatic transmission, power steering, power seats, tilt wheel, air bags, Pw,A/C, Leather Interior, New Dash, turn signals. The car was restored and resto modified by a retired GM employee. It is what you need to drive on todays highways, Peppy Vortex engine, all the conviences you come to expect with newer cars. 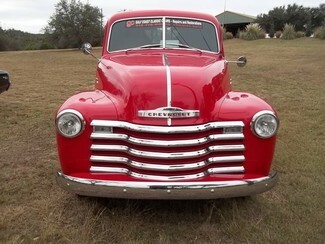 Mr Goodwrench took a chevy S10 engine, and complete interior and nicely fit to this 1953 chevy p/u. Looks Original from the outside, with all the modern safety and connvience upgrades. You can cruise on the expressways with any car , it is ready to go. The only thing I would do to this truck if i drove it much would be to put disc brakes on the front. i have 70 cars in my collection so I am not able to drive them all. This beauty needs to be driven.